Posy arrangements bursting with colour of your choice. 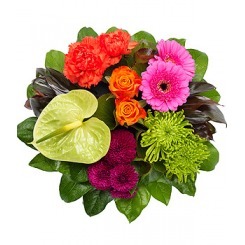 A vibrant posy in cerise, orange, purple and lime. Please note that all flowers are subject to availability and substitutions may be made at the florist's discretion. 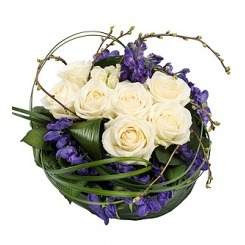 A white based posy with a green ribbon edge and a rose and orchid spray. Please note that all flowers are subject to availability and substitutions may be made at the florist's discretion. 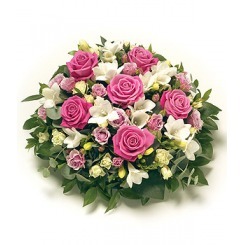 A beautiful posy of pink and white scented flowers. Please note that all flowers are subject to availability and substitutions may be made at the florist's discretion. A delicate posy arrangement in soft, pastel shades. Please note that all flowers are subject to availability and substitutions may be made at the florist's discretion. 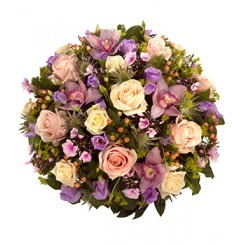 A stunning purple and white posy pad arrangement. Please note that all flowers are subject to availability and substitutions may be made at the florist's discretion.